Merk Insights - Gold at ECB: Accident or Strategy? Gold at ECB: Accident or Strategy? 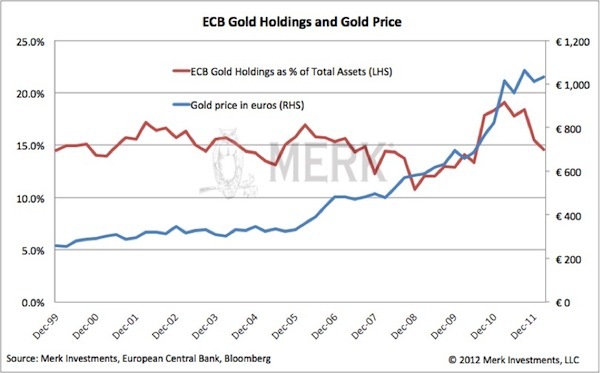 When the euro was launched, the European Central Bank (ECB) held approximately 15% of its assets in gold. That ratio has remained reasonably stable, giving rise to a variety of chatter, including suggestions that it may displace the U.S. dollar. We pursue the question on whether the ECB’s gold holdings are an accident or strategy. Let’s look at the numbers. 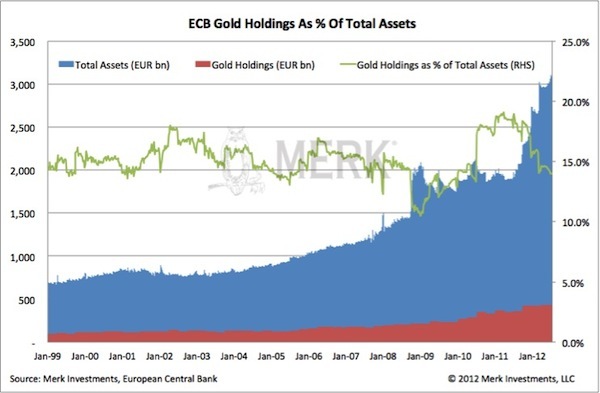 Below is a chart depicting the percentage of gold relative to the ECB’s total assets. As one can see, the percentage has remained reasonably stable despite a significant growth in total assets. The interpretation shows that while money can be printed, wealth cannot be created out of thin air: as money is printed, gold has appreciated versus the euro. So while inflation has not shown up in indicators such as the Consumer Price Index, monetary easing is rightfully reflected in the price of gold. 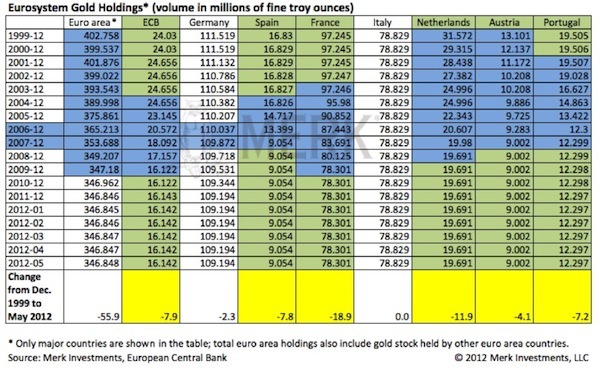 Relevant is that each nation in the Eurozone pursues its own agenda with regard to its gold holdings. Germany has resisted political pressure within Germany to sell gold, as Bundesbank (Buba) profits would need to be transferred to the government; the hawkish Buba has indicated that it would be considered selling gold to help finance the government’s deficit. Italy, as one can see, has not sold any gold. Conversely, as a percentage of their holdings, the Netherlands had been rather eager to sell gold up until the financial crisis; Portugal, too, was an aggressive seller. As one can see, gold sales are not particularly related to the financial health of a Eurozone nation, but more to the cultural attitude in the respective nations towards gold. Note that the chart above starts in 2006, so as to focus on the period of the financial crisis. The Fed has been more aggressive than the ECB in printing money. 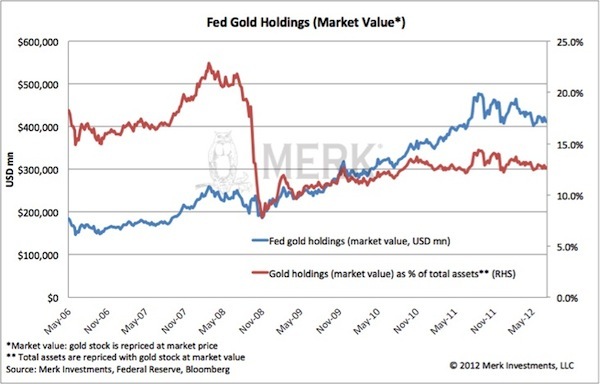 As such, the percentage of gold in relation to total holdings has declined at the Fed in a more pronounced fashion. 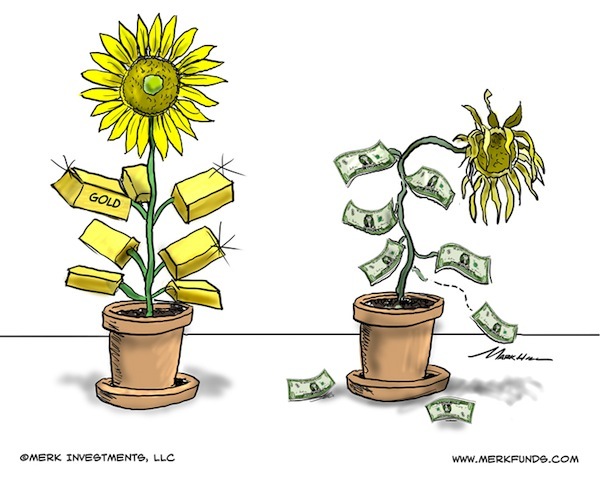 There is clearly no perfect relationship between the size of the balance sheet and the price of gold, as other factors also influence the supply and demand of gold; however, increasing the supply of fiat money (dollar, euros) may decrease its value when measured in real assets, such as gold. We have in the past referred to the Fed as the champ in printing money (as measured by the percentage balance sheet growth since August 2008), although the Bank of England has, as of late, taken on that title. But we digress. From what we see, central banks have been scared into holding gold since the onset of the financial crisis. 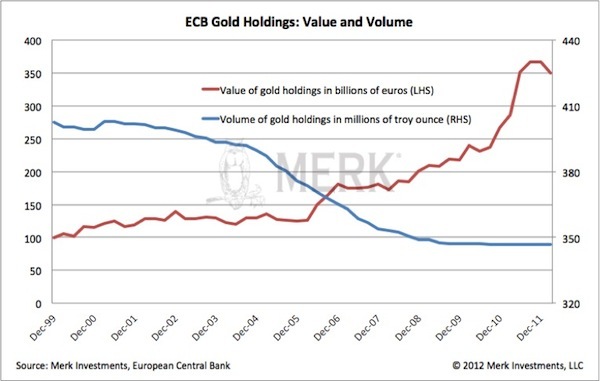 Beyond that, we don’t see an active strategy at the ECB to keep its gold reserves at 15% of total assets. Instead, the ECB’s comparatively measured approach has simply lead to a reasonably stable percentage of gold reserves. Of course that was before ECB President Draghi said on July 26, 2012, that he shall do “whatever it takes to preserve the euro.” (an interpretation of that may be that more money printing is on the way). For now, the cultural differences in responding to the financial crisis (Europe: think austerity; US: think growth) suggest that the euro should outperform the U.S. dollar over the long term, assuming the not-so-negligible scenario of a more severe fallout from the Eurozone debt crisis won’t materialize. It may help to keep in mind that historically inflation is the response to a deflationary shock. If market forces were left to themselves, we believe the credit bust of 2008 would have caused a major deflationary shock. It’s the reaction of policy makers that fight market forces that may lead to inflation. Bernanke as of late brushed off such pessimism. As the charts above show, however, gold has been a sensitive – and sensible I might add - indicator to the trigger-friendliness of our central bankers. We have long argued that investors may want to take a diversified approach to something as mundane as cash. Please sign up to our newsletter to be informed as we discuss global dynamics and their impact on currencies. Please also follow me on Twitter to receive real-time updates on the economy, currencies, and global dynamics.